In the last 12 months I’ve been involved in a Non IM online community and have become friends with one man in particular, he has an online presence, selling his high end out door furniture. He’s an older guy and I love what he’s done with his website and is totally self taught. He gets 30% of his business from online sales and the rest are referrals. He was here at my place one day and asked about what I do, etc. Once he learned that I do SEO, he wasn’t sure what it meant, but loved that I worked the search engines. So I offered to show him exactly what we do, by getting his site ranking for the terms he wanted. His site was ok, I just requested he put this term he was after in the title of his website. When he got home he did it immediately and emailed me. He offered to pay me for this work, but I won’t accept money from friends for something that takes me so little time, besides, I just love this stuff and am happy to show him the results, because I know from very basic research, this work I’m doing can make a huge difference in his and his families life. So little time I hear you say? If you know me, you’ve probably heard of me referred to as the “King of Automation” , well I might not be there now, but its a title I’m very happy to work towards. As I said I’ve been developing these strategies over the years and had my head developer Max watch what I do by hand, and he goes and automates these process’s for me, to create software applications to do all these mind numbing tasks for me. Over the last 3 years, these little software applications have improved and gotten smarter and exponentially more sophisticated. Then, at the beginning of 2008 we put them all together, into one amazing piece of software. Then late last year (2009), we totally re designed it completely to make it even easier to use with a flowing design, enter data, click next, enter more data, click next, gather unique articles, click next, and called it Evolution 2. or EVO 2 for short. (he’s a very cute little character, you can see him at work on the video at the page I will show you shortly). So this software totally automates the whole “SEO Banking and Ranking” process we’ve been discussing completely and even more. Remember I was talking about getting links from High Page Rank sites? On top of all the above, my software currently has a list of 135 High PageRank sites (all Page Rank 5 or Higher, lots of 6 7 8’s), the software automatically creates accounts on all of these sites, places your links on them and then creates RSS feeds from these account URL’s and submits them to the RSS Aggregators. (noting, each month we add new High Page Rank sites to EVO 2, and remove those no longer suitable, they have either changed their terms, specs or layout and are no longer suitable, so each month the number of high page rank sites grows). And that’s on top of creating accounts on free blog hosts, submitting unique articles related to your chosen niche, posting their RSS Feeds to the Rss Aggregators, submitting your sites links to the Social Bookmarking sites, and much more. Getting back to my friend, I was in the position to help him out with his site, because it only takes me 4 mins to setup my software to promote his site, then I start the software and it does the rest. This is exactly what I did, found a great term in the Free google research tool for him to target. I did this with him in a chat that night. We decided on outdoor garden furniture- this has a monthly search volume of 6600 per month, though I knew we could rank for many other terms on top of this. I searched for his site in google.com.au- he is only interested in Australian traffic etc. It was not found in the top 1000 results, though his site did come up for his business name and was getting sparse traffic from related terms. So that night I did the first run of my software http://www.BruteForceSEO.com over it. Within 4 days, the site entered the google.com.au index at approx 524 (if memory serves me correctly), then after 2 weeks we got up to 24 and started to see trickles of traffic for this term. I ran my BruteForceSEO: EVOII software once every 4 days, like I tell my members to do, and my friends site was bouncing between 15 and 22 for the duration- he was already happy getting much more traffic than before. Then exactly 6 weeks and 1 day later- I remember it was on a Monday, he got NUMBER ONE (#1) position for “outdoor garden furniture” and Number TWO (#2) for “outdoor furniture” which has a search volume of WAAAAY more than original term 🙂 I knew this, as I was checking daily and just waiting for it to happen. I was waiting for it to happen because through experience, it always does, just running my software every 4 days will get me the rankings I desire at some point in time. Shorter the less competition, longer the more competition. The reason I point this out, is because its really that simple, though people over complicate it or, loose patience, most likely just before they were going to achieve the rankings they desire. You have to be patient and stay with the program, and it will come… every time! In the next 4 days, he received 10 or 12 orders for his high ticket item custom outdoor tables. To say he was blown away is an understatement. The next day he emails me with all the other terms he is now ranked very highly for… Lots of terms I didn’t target at all. The reason his site is now ranking for many other terms is because his site is now trusted in google.com.au, and google.com.au is giving him trusted rank status. Because his site has this status, his site is ranking higher than other sites that are targeting these terms. Time cost to me, 4 mins each 4 days over 6 weeks. so all up under 1 hour of my time. If I was to do it by hand, as directed above, each of those promotions completed by my software would take about 1 week to accomplish. I did approx 10 promotions using the software, by hand it would have taken close to 10 weeks to achieve the same results in the search engines. This gives you a good example of the power of software automation, utilising it gives you rankings faster with much, much less input from yourself. So roughly One Hour of my time has helped a friend big time, to the point where he says “Normally the summer months are slow, but now I’m gearing up for a very busy summer” Thanks to EVO 2 and a little time from me, this has gained me a friend for life and has also shown him that I’m a man of my word- I told him I could do it and over delivered big time with all the additional terms he is now ranking for. Case Study about Petes SEO Trust Bank! I love these stories. I have a few of my own using the powerful evo. It has become my seo “backbone”. I’m going to have to find time to write more of these case studies down, there’s been many over the years..
is getting repeated links from same domain useful? In your example for your friend, did you just happen to have content on outdoor furniture lying around to use? Did you just use articles from article directories? The content piece has always been the severe limiting factor in using such awesome software. What is your favorite solution? Do the web 2.0 properties often shut down the accounts because of duplicate content, or any other reason? Thank you for answering these candid questions. You obviously have answers, because your software has worked wonders for a long time for people. Most people say that Content is King, and it is, but for specific SEO purposes, IMHO LINKS are king! With my friends site, the only change made to it was the title, putting the keyword phrase we were targetting to the front of his main page title, followed by his company name. Thats the only change, no onpage seo, no new content, nothing. Just a whole lot of links from trusted parties, and the article content I used in EVO 2, comes from within EVO 2 itself. I used his keywords in EVO and sourced 6 new original articles each time I promoted his site, (e.g. every 4 days) This content is used on the web2 properties e.g. blogs inside EVO 2, plus the tons of links on high page rank sites within EVO 2 etc. I think that you just touched on the most important part. It was the continued use of your program. Most of us get frustrated after a month of doing something and quit. Long time seo people understand that even with this amount of links supplied by EVO 2, some niches can still take time to get the rankings people want etc. Its the newbies to SEO who sometimes, unfortunately leave too early, though we have a lot who use the 7 day free trial, and quit, but come back soon after once their sites start ranking well etc.. Whether you use this program or software for your SEO needs, there are definitely 3 things that need to be incorporated with your techniques. You just can’t set it and forget it anymore. Put in a little consistency and variety into your SEO and see what happens in a few months time. Help, the page you link to in your last post #5 does not work. The link to the page with your recommendations of different Web 2.0 links. Hey Rick I tested it just now its working fine? I can personally state that I’ve fun EVO had many of my web pages indexed and ranked sometimes within 48 hours or less. The speed and quantity by which backlinks are created for you is valuable. 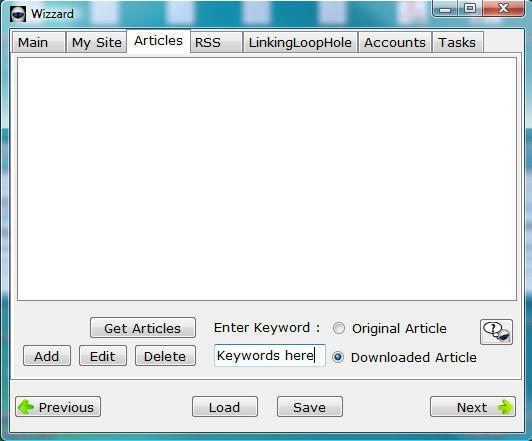 In addition, the rss feed submission feature does help to get those backlinks found, for anyone who wants to know. I would be really interested in hearing more detailed info on each case study however. Such as, what the process was after you created the backlinks and the rss feeds. I like your system and how it’s able to help people get up on the search engines. Any chance of getting a discount on the $157 monthly payments – at least on the first couple of months until we’re in profit since it takes 6-8 weeks to really see major changes? I know if it was set up that way I’d sign up in a heartbeat. Great case study though! By the way, do you have any good tips on getting offline businesses that need SEO services? I have been using BF EvoII for around a year now, I have run the software over 500 times. It’s easily does a great job on light & medium competition keywords. However, not so good with the more competitive ones. Therefore, focus on where it works best and don’t worry about the rest! EVO II makes things so easy that they are almost unbelievable. Do you need to set up new accounts for all the web 2.0 sites if you are currently using them but with different logins/usernames? I totally believe links are king. But many platforms will cancel your account if the content you post to them is not unique. What do you mean when you say you “sourced 6 new original articles each time you promoted his site”. Where did you get these articles? Where did you put them, if the content you used in EVO 2 comes from within EVO 2 itself? I’m trying to get a clear picture of how this works. I’ve been paying for Brute Force SEO/ EVO2 for a couple of years, but have not yet really used it, since my team got stuck at the content piece, and I have not taken time away from my huge project to figure out exactly how the process works and what to do. So the content piece is my hold up. First image shows you the Articles Module. you enter your chosen keyword phrase. and my EVO members can now source unique article content from his service. Then click on Get Articles, you will receive 6 unique articles based on your chosen term. Notice that your main term is at the front of each article title already? EVO does this for your automatically, plus puts links in the bottom of each of the articles for you. These are posted to the high page rank free blog hosts we use, each of which has an RSS feed, these free blog hosts are also strategically all linked to each other, providing the links in your articles more juice and trust status. plus their RSS feeds are submitted to all the RSS Aggregators etc.. Noting each time you click on “Get Articles” Button, you will receive 6 new unique articles each and every time. Out of interest, how much does it cost to get 6 unique articles and how long does it take from ordering them to receiving them? If a ‘local’ search term has competitors with less than 100 low PR links (search volume of approx 1k per month) and I have a keyword rich domain how long would you expect it to take to get onto page 1? Would I be able to simply run your software every four days and not need to do anything else to create backlinks – I keep reading so much stuff about different methods of getting links, getting thos links indexed with different tools etc etc. It gets confusing. I’d like something that pulls it all together in one place! Thanks for the story though – it’d definitely be good to hear more of these! When using EVO II, there is no cost for the articles, see my reply to sarah above, and the image links. Of course its impossible to state categorically that you will rank for that term, that I know very little above, but an educated guess tells me that you’ll get it relatively easily, running EVO 2 ever 4 days, till you get the ranking you want. It really is as simple as this..
Best way is to test of course, though I cannot see any reason why you won’t rank for that term.. I am the (older) man Pete has mentioned (thanks mate). I am now in a bit of a panic realising that I am going to have to stop building furniture and employ people to do it for me very soon. This morning an order came in for a further 18 tables putting the total on back-order to 45 which is by far the most orders I have ever had and I am having to make clients wait. Time for a price rize and no more discounts I think! Thanks Pete, you’re a champion, and I still owe you big time! That’s awesome to hear about that extra business mate. And very happy to have helped be a small part of it. Very nice info… I think I just might give this a try…. I do have a question though… Which I’m sure it will, but can I harness the power of this software and take a very competitive niched website to the first page of Google? I’m talking a competition of about 400,000,000 million other websites? which is similar range competition etc..
can i get this …. BruteForceSEO: EVOII ? ?